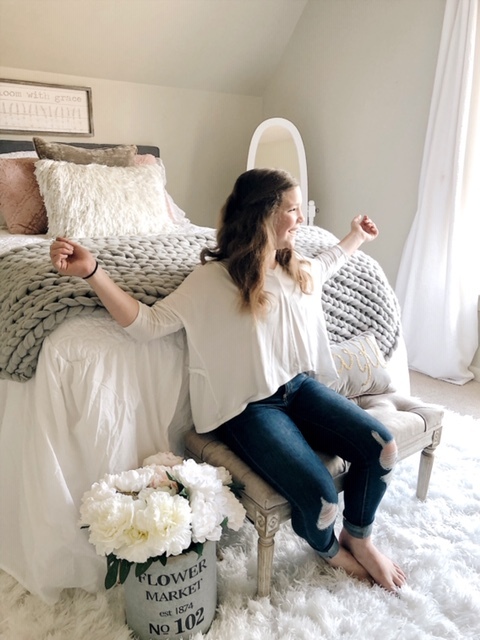 With Spring the air, my 11-year-old daughter was feeling the winter blues with the overall feel of her bed and the surrounding decor. 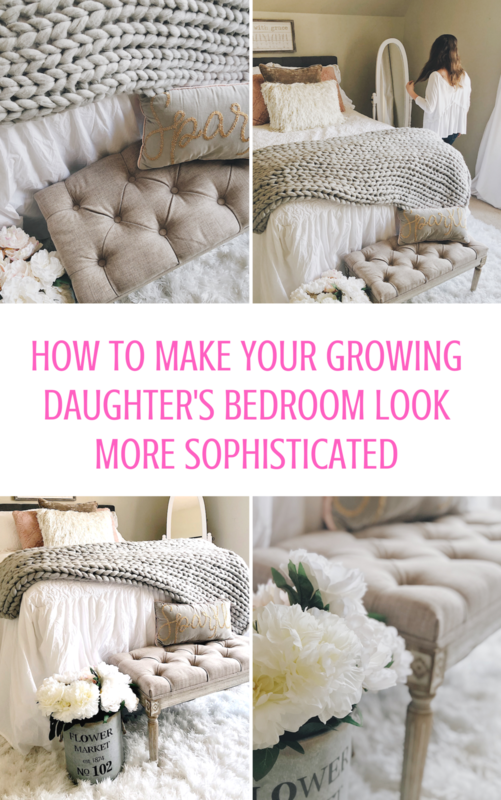 She was feeling like it was not up to par with the rest of her room; she wanted to swap out some pieces and add other items to freshen it up and give her a more complete and sophisticated bed space. With some purging of old books, a side table that was too small for her to be useful anymore, and other things that could be given away, it already felt more fresh. She also took off her heavy comforter and replaced it with a white quilt and coordinating shams we already had on hand. We chatted about what she’d enjoy having in this part of her room now that some of the younger pieces from her bed area were out. Not surprisingly for a pre-teen girl, she mentioned wanting a full length mirror. She also mentioned a nice cozy blanket to curl up and read books with, somewhere to sit with her friends when they’re over, and a rug to help cover some of those nail polish drops she had made when she was a little girl (!!!). We found every thing she described from Joss & Main. 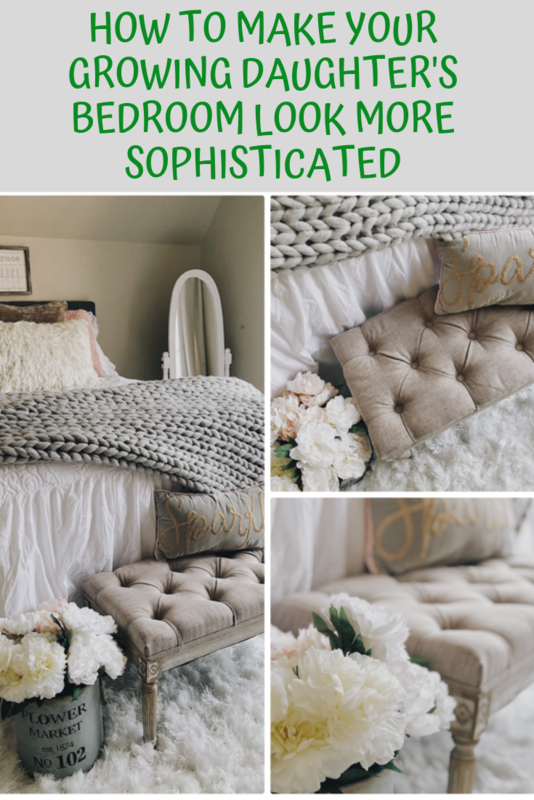 I cannot wait to share with you each piece below; Combined, they did the trick, updating her outdated bed area to a fresh, spring time space full of comfort and function! The Elam Knit Throw found here is exactly the look and feel she wanted to drape across the bottom of her bed. It’s so soft and the perfect layer to have on cool spring evenings when the sun has gone down. Plus, she loved the grey color! The Letellier Upholstered Bench found here is the perfect piece to go at the foot of her bed. This bench has already proved useful; friends who are over sit here, plus she uses it to put on her shoes. The Rogge Oval Cheval Mirror found here is an amazing deal for a mirror like this and is perfect for a growing teen girl room. It was super easy to put together as well! She is enjoying having her own full length mirror and not having to go use her big sister’s anymore. Needless to say, she was thrilled with the outcome of this update! We swapped out the old with the new and it feels so fresh in her bedroom once again! Just add a bucket of faux flowers and it’s a spring happy space.